Kenneth Joseph Arrow (August 23, 1921 – February 21, 2017) was an American economist, who was Professor Emeritus of Economics in Stanford, and joint winner of the Nobel Memorial Prize in Economics with John Hicks in 1972. The choice among these alternatives in any given case depends on the degree of difficulty consumers have in making the choice unaided, and on the consequences of errors of judgment. It its the general social consensus, clearly, that the laissez-faire solution for medicine is intolerable. The certification proposal never seems to have been discussed seriously. In an ideal socialist economy, the reward for invention would be completely separated from any charge to the users of information. In a free enterprise economy, inventive activity is supported by using the invention to create property rights; precisely to the extent that it is successful, there is an underutilization of the information. I want, however, to conclude by calling attention to a less visible form of social action: norms of social behavior, including ethical and moral codes. I suggest as one possible interpretation that they are reactions of society to compensate for market failures. It is useful for individuals to have some trust in each other's word. In the absence of trust it would become very costly to arrange for alternative sanctions and guarantees, and many opportunities for mutually beneficial cooperation would have to be, foregone. Kenneth J. Arrow (1951) Social Choice and Individual Values. 2nd ed. 1963. Wiley, New York. In a capitalist democracy there are essentially two methods by which social choices can be made: voting, typically used to make ‘political’ decisions, and the market mechanism, typically used to make ‘economic’ decisions. In the emerging democracies with mixed economic systems Great Britain, France, and Scandinavia, the same two modes of making social choices prevail, though more scope is given to the method of voting and to decisions based directly or indirectly on it and less to the rule of the price mechanism. Elsewhere in the world, and even in smaller social units within the democracies, the social decisions are sometimes made by single individuals or small groups and sometimes (more and more rarely in this modern world) by a widely encompassing set of traditional rules for making the social choice in any given situation, for example, a religious code. The idealist doctrine then may be summed up by saying that each individual has two orderings, one which governs him in his everyday actions, and one which would be relevant under some ideal conditions and which is in some sense truer than the first ordering. It is the latter which is considered relevant to social choice, and it is assumed that there is complete unanimity with regard to the truer individual ordering. From the point of view of seeking a consensus of the moral imperative of individuals, such consensus being assumed to exist, the problem of choosing an electoral or other choice mechanism, or, more broadly, of choosing a social structure, assumes an entirely different form from that discussed in the greater part of this study. In this aspect, the case for democracy rests on the argument that free discussion and expression of opinion are the most suitable techniques of arriving at the moral imperative implicitly common to all. Voting, from this point of view, is not a device whereby each individual expresses his personal interests, but rather where each individual gives his opinion of the general will. p. 85 as cited in: Gerry Mackie (2006) "The Reception of Social Choice Theory By Democratic Theory". I was early regarded as having unusual intellectual capacity. I was an omnivorous reader, and I added to that a desire to systematize my understanding. As a result, history, for example, was not merely a set of dates and colorful stories; I could understand it as a sequence in which one event flowed out of another. This sense of order crystallized during my high-school and college years into a predominant interest in mathematics and mathematical logic. Arrow (1984) "November 1984 lecture at Trinity University". Lecture presented November 5, 1984. Multiple discoveries are in fact very common in science and for much the same reason. Developments in related fields with different motivation help one to understand a difficult problem better. Since these developments are public knowledge, many scholars can take advantage of them. It is pleasant to the ego to be first or among the first with a new discovery. However, in this case at least, the evidence is clear that the development of general equilibrium theory would have gone on quite as it did without me. Studying oneself is not the most comfortable of enterprises. One is caught between the desire to show oneself in the best possible light and the fear of claiming more than one’s due. Even Ricardo's most famous accomplishment, the law of comparative advantage in foreign trade, is incomplete, though not wrong. I am old-fashioned enough to retain David Hume’s view that one can never derive “ought” propositions from “is” propositions. The two issues, method and value, are distinct. Krugman's whole attack is directed at a statement made neither by Arthur nor by Cassidy. Krugman has not read Cassidy's piece with any care nor has he bothered to review what Arthur has in fact said. I want to stress that rationality is not a property of the individual alone, although it is usually presented that way. Rather, it gathers not only its force but also its very meaning from the social context in which it is embedded. Certainly, there is no general principle that prevents the creation of an economic theory based on other hypotheses than that of rationality. Not only is it possible to devise complete models of the economy on hypotheses other than rationality, but in fact virtually every practical theory of macroeconomics is partly so based. The price- and wage- rigidity elements of Keynesian theory are hard to fit into a rational framework, though some valiant efforts have been made. … But if the Keynesian model is a natural target of criticism by the upholders of universal rationality, it must be added that monetarism is no better. I know of no serious derivation of the demand for money from a rational optimization. … The use of rationality in these arguments is ritualistic, not essential. Collective action is a means of power, a means by which individuals can more fully realize their individual values. Trust is an important lubricant of a social system. It is extremely efficient; it saves a lot of trouble to have a fair degree of reliance on other people's word. Unfortunately this is not a commodity which can be bought very easily. If you have to buy it, you already have some doubts about what you have bought. As is by now well known, attempts to form social judgments by aggregating individual expressed preferences always lead to the possibility of paradox. There are many other organizations beside the government and the firm. But all of them, whether political party or revolutionary movement, university or church, share the common characteristics of the need for collective action and the allocation of resources through nonmarket methods. It is this thinking which I think gives rise to the greatest tragedies of history, this sense of commitment to a past purpose which reinforces the original agreement precisely at a time when experience has shown that it must be reversed. The purpose of organizations is to exploit the fact that many (virtually all) decisions require the participation of many individuals for their effectiveness. Uncertainty means that we do not have a complete description of the world which we fully believe to be true. In eras when authority or at least specific authorities have been questioned, there is more tendency to examine the roots of and the need for authority. The owl of Minerva flies not in the dusk but in the storm. Decision theory, as it has grown up in recent years, is a formalization of the problems involved in making optimal choices. In a certain sense — a very abstract sense, to be sure — it incorporates among others operations research, theoretical economics, and wide areas of statistics, among others. The formal structure of a decision problem in any area can be put into four parts: ( 1 ) the choice of an objective function denning the relative desirability of different outcomes; (2) specification of the policy alternatives which are available to the agent, or decisionmaker, (3) specification of the model, that is, empirical relations that link the objective function, or the variables that enter into it, with the policy alternatives and possibly other variables; and (4) computational methods for choosing among the policy alternatives that one which performs best as measured by the objective function. I was a very polite person, though. Paul Samuelson tells these stories how he used to correct his professors. I assume that’s true. But I wasn’t that type. The Austrian a priori dogmatism (von Mises, especially; Hayek, to a lesser degree). I then follow up with four major aspects of economic research in the last 60 years, the period of my scholarly activity. One, econometric methodology and practice, is of such fundamental importance that it cannotgo unnoticed, although I played no role in it. With the other three, general equilibrium, dynamic processes, and uncertainty and information, I was more intimately involved. 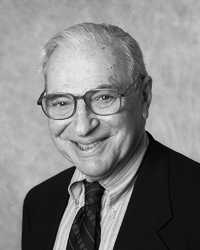 In 1972 American economist Kenneth Arrow, jointly with Sir John Hicks, was awarded the Nobel Prize in economics for “pioneering contributions to general equilibrium theory and welfare theory.” Arrow is probably best known for his Ph.D. dissertation (on which his book Social Choice and Individual Values is based), in which he proved his famous “impossibility theorem.” He showed that under certain assumptions about people’s preferences between options, it is always impossible to find a voting rule under which one option emerges as the most preferred. Kenneth Arrow (1921- ) in Concise Encyclopedia of Economics, edited by David R. Henderson. In technical economics, I see a peak with Paul Samuelson and Kenneth Arrow and some of the core developments in game theory. Since then there are fewer iconic figures being generated in this area of research, even though there are plenty of accomplished papers being published. During this period I also came-across Kenneth Arrow's now famous Social Choice and Individual Values. Although I hardly did full justice to that pioneering work, it emboldened me to take a stab at a much more formal presentation than I had encountered in political theory. The form of my two chapters certainly owes something to my having ploughed my way through that book. For better or worse, Arrow's book must also have influenced my decision to present parts of the argument in a formal notational system (though only in footnotes and appendices). I was influenced very early on, my first time at the—I spent a year at the Center at Palo Alto, the Center for Advanced Study there, and I became a good friend of Kenneth Arrow. I think he was not at the Center that year but he lived in Palo Alto. [...] Marvelous man. Both as a person and as a scholar. And I became as I say greatly influenced by the way in which he dealt with phenomena. [...] So I was influenced by that as a model, a way of thinking more abstractly, perhaps, than customary, about democratic theory. Making clear the premises, the epistomological assumptions and matters of that kind, and I think that sort of set the stage. And then once you get in of course, into that field, which was not highly— I don’t know how to put this properly—as a formal field of political science was not highly developed at the time, once you get into it you quickly become aware of how rich the potential subject matter is. One of the enormous changes, perhaps anticipating your question, one of the changes in the world is the extraordinary increase in the number of countries that, by the standards that we use today, can be called democratic—always, I repeat this and repeat this, but, always keeping in mind the difference between the ideal and the threshold at which we now accept a country as democratic, or a polyarchy as I would say. And the enormous increase in the number of those available for study—when I was a graduate student, there were maybe half a dozen countries that you could study: France and Britain and, I’m not quite sure of Canada at that time . . . and then the expansion created out there a field . . . that was both a challenge and an opportunity. The interesting thing is that Ken Arrow was a dove and Bob Solow as then a hawk, in 1963-4. We used to have huge debates. Hahn was very hawkish, Meade was hawkish, only Arrow and what's now the Cambridge left were doves, particularly the Asians, for obvious reasons. After all, it was the Asians who were being napalmed. There were terrible fights going on, and the beginning of huge rifts in the faculty over the Vietnam war. Solow switched, later on, and to his everlasting credit came out and said he'd switched. Arrow was always a dove. That's why, fond as I am of Bob Solow, and much thought I admire him, I've always admired Arrow more, because Arrow, I think, has always had the right instincts. He's a self-declared socialist, he was a dove, he was always active on civil rights, he fought for Sam Bowles at Harvard, and so on. He's always gone out on a limb for the right issues - on the left issues, actually. By that time (1967-8), I was in the thick of moratoria and death threats and bombs and all the rest of it. I wrote the survey in about four months. It was refereed by Arrow, Stiglitz, Samuelson and one other - I've never found out who it was. Samuelson recommended publication 'as is'. Arrow wrote to me and said, 'May I use you brilliant survey for my graduate class at Harvard? ', which is the letter I prize most of any I've received in all the world. Stiglitz didn't say anything at the time, but he saved it all up for when he wrote that very critical review article of my book (which he kept calling my article!) in the Journal of Political Economy. But the old dilemma between efficiency and fairness was about to be shattered by a young New Yorker called Kenneth Arrow, who knew all about unfairness after watching helplessly as a teenager while his father lost his successful business and all his savings in the Great Depression. The desire for social justice stayed with Arrow, but intellectually he couldn’t just ignore the question of efficiency. The young economist set his logical mind to wrestling with the tension between the unerring efficiency of the free market and the imperative that some kind of fairness should prevail. His solution was brilliant, twisting the traditional thinking about competitive markets and efficiency on its head. He proved that not only are all perfect markets efficient, all efficient outcomes can be achieved using a competitive market, by adjusting the starting position. It is not easy to see him. Not because he’s short. Rather because the piles of books and papers scattered around his admittedly relatively narrow office in the Landau Building are so high. ‘They’ve moved us here and now I’m trying to look through all my stuff and see what I can possibly throw out’, says Kenneth J. Arrow, rising swiftly from behind one of the book piles, with an apologetic gesture. In spite of his 86 years, he seems physically quite fit and, no wonder, he prides himself in cycling to the office every day. The room is nice, bright, modern and new, but there is no way Arrow could possibly fit everything into the book shelves along the walls. ‘Never mind’, he says, laughing. He has a great warm open smile, and is eager to talk – which he then does at an amazing speed. Politely, he liberates a chair for me, opens a drawer next to himself for me to place the microphone in since there is no more space on the desk, of course – and off we go. And I am glad that you talked to Ken Arrow. But Nobel laureates, who have wide responsibilities and much on their mind, are not necessarily on top of what has been going on in research outside their usual field. I happen to know of one laureate who, circa 1991, was quite unaware that anyone had thought about increasing returns in either growth or trade. [Arrow's] experience as an Air Force weather forecaster during the Second World War "added the news that the natural world was also unpredictable." ... One incident that occurred while Arrow was forecasting the weather illustrates both uncertainty and the human unwillingness to accept it. Some officers had been assigned the task of forecasting the weather a month ahead, but Arrow and his statisticians found that their long-range forecasts were no better than numbers pulled out of a hat. The forecasters agreed and asked their superiors to be relieved of this duty. The reply was: "The Commanding General is well aware that the forecasts are no good. However, he needs them for planning purposes." Peter L. Bernstein, Against the Gods: The Remarkable Story of Risk, Chapter 12, "The Measure of Our Ignorance".